Encapsulation — Extends time between deep extractions and reduces re-soiling. Deep Extraction — Deep, restorative cleaning. Pre-spray and Rinse — Cleaning of surface soiling and extraction of soil in carpet while leaving the carpet free of shampoo or detergent, reducing resoiling. Pre-spray and Extraction — Deep, restorative cleaning for heavily soiled carpet. Rinse Only — Surface cleaning of carpet and elimination of detergent and soap build-up, brightening the carpet and reducing resoiling. Change from interim to deep cleaning process at the turn of a switch—no mechanical changeover needed. Deluxe models are equipped with dual chemical tanks, al lowing instant change from one chemical to another. This provides multiple cleaning options with no draining of tanks. Floating, dual counter- rotat ing brushes agitate the cleaning solution into both sides of the carpet nap for even, thorough cleaning and improved carpet appearance. No operator adjustment needed. With the interim method using the iCapsol encapsulating chemical, the carpet is dry and ready for traffic in approximately 20 minutes. Low dBA of 59 during interim cleaning (Voyager DUO) and 63 (Commodore DUO). iCapsol interim cleaning process extends the time between scheduled deep extractions. 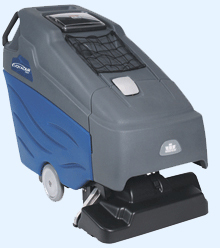 Dual floating vac shoes with glide strip provide consistent contact over uneven surfaces and increased solution pick-up.